The Massachusetts Bay Transportation Authority (MBTA) began as a collection of street railway companies in the 19th century. Teams of horses pulled “streetcars” through the streets of Boston, transporting groups of people more quickly and comfortably than they could ever travel by stagecoach. By today’s standards, the track system over which the streetcars rode was very primitive. At the very beginning, the rails were roughsawn sections of hardwood timber set in paving stones. The timbers wore very quickly and were subject to harsh environmental conditions that shortened their life even more. As the technology of steelmaking evolved, wooden rails were replaced with sections of cast iron. The early rail sections loosely resembled the steel ingots from which today’s rails are made. They were generally squat, thick-webbed sections that were spiked longitudinally to wooden timbers or “sleepers” laid in the ground beneath the paving stones. Eventually, the sleepers, or crossties, came to be laid perpendicular to the rails and plates began to be used to support the rails on the ties. As the manner of attaching the rails to ties changed, so did the configuration of the rails. One of the early challenges for street railway operators was to provide a space next to the rail for the flange portion of the wheel to occupy. Girder rail, which incorporated a running surface and flangeway in one section, was developed to help accomplish this. Paving stones could be placed against both sides of the rail making for easier installation and maintenance. There were many different girder rail sections in use during the early days of street railway transportation. Owing to the large number of foundries in almost every major U.S. city in the 1800s, there were different rail sections in use in every street railway system. Over time, many of these local foundries died out and along with them the individual rail sections they produced. The Boston Elevated Railway Company, which succeeded the West End Street Railway Company and ultimately would become the MBTA, began to use two new girder rail sections produced by the Bethlehem Steel Company. These sections were 128-pound girder rail and 149-pound girder guard. The two sections were nearly identical, except the girder guard section had a raised flangeway component for use in curved track. The purpose of the raised guard was to reduce rail wear by restraining the wheel flange as it moved laterally in curves and to help minimize the chance of derailment. These rail sections were very successful and were used by other street railway companies in Toronto, Philadelphia, San Francisco and elsewhere. Streetcars, trolleys and light rail vehicles of the MBTA and its predecessors ran on the Bethlehem Steel girder rail sections for more than 50 years. Over the years, demand for girder rail by U.S. transit systems declined to the point that Bethlehem Steel stopped rolling it. The MBTA was able to purchase enough of the last remaining girder rail to meet its replacement needs for several years. As time went on, the MBTA realized that its inventory of girder rail was finite and that a replacement rail section was needed. European rail sections were evaluated for their compatibility with MBTA light rail vehicles, ongoing availability and other factors. The MBTA identified a European section, GGR-118, and selected it to replace the Bethlehem sections that had been in use for so many years. The most attractive feature of GGR-118 was that it had a raised guard component, which was thought to be a critical requirement at the time. The rail also was the same height and base width as 115 RE, which also was used throughout the MBTA system. After a couple of years, however, the producer of GGR-118 stopped rolling the section. This left the MBTA in a precarious position. As a cost cutting measure, the organization had reduced inventory of replacement parts wherever possible. Consequently there was only enough stock of GGR-118 on hand for spot renewals, with no possibility of large changeouts or new installations. These developments sent MBTA engineers “back to the drawing board” to investigate potential replacements for a discontinued girder rail section for the second time in 15 years. As no girder rail was being produced domestically, several European sections were evaluated. After much research the MBTA decided to use a girder rail section known as NP4aM. (Toronto Transit had recently begun to use NP4aM after consuming its supply of GGR-118.) Although the rail’s height and width dimensions were not ideal, the MBTA thought the resulting compromise issues could be overcome. The flangeway width of the NP4aM rail, however, was an issue for the MBTA. 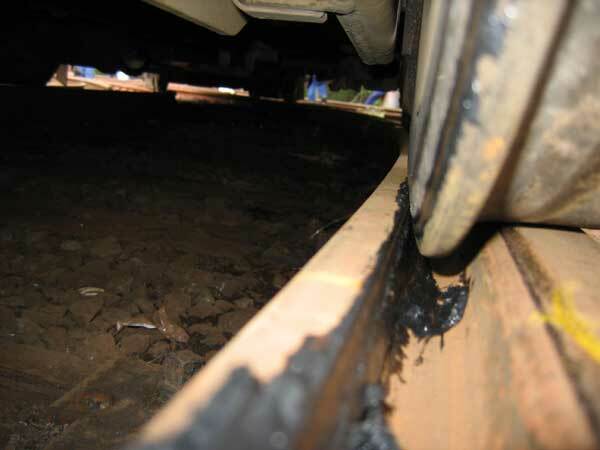 The flangeway width of the Bethlehem 149-pound rail was a little more than 1-13/16 inches, the prevailing standard for more than 50 years on the MBTA. As a result, the flangeway width at all tongue and mate street switch castings was also a little more than 1-13/16 inches. This created a compromise problem when the MBTA decided to transition to the use of GGR-118 rail, which had a flangeway width of a little less than 1-5/8 inches. This meant that where it was necessary to use the new rail to tie into existing street switches, there would be a flangeway discrepancy of about 1⁄4 inches. The restraining face of the switch casting arms was welded to make the flangeway width compatible. The flangeway of the NP4aM rail was another story altogether. It was slightly less than 1-3/8 inches — about 1/4-inch less than the GGR-118 and 1/2-inch less than the original Bethlehem 149-pound rail. This was a significant issue. Aside from the compromise issues, the MBTA was concerned that the flangeway might be too narrow for MBTA light rail vehicle wheel flanges, especially in sharp curves. The flangeway situation was further complicated by the fact that the MBTA had recently transitioned to a new wheel profile on its light rail vehicles. After having run the same wheel profile on several generations of streetcars, trolleys and light rail vehicles, the MBTA introduced a markedly different profile in 2002 – 2003. This wheel profile, known as the Interim Wheel Profile (or IWP), was designed to combat a wheel climb problem on the independently rotating wheels of the low-floor center section of new light rail vehicles that were delivered in 1999 – 2000. The major modification to the wheel profile was a change in the flange angle, which increased to 75 degrees from the longstanding standard of 63 degrees. The flange on the new wheel profile was also thicker. The prospect of introducing the new NP4aM girder rail profile with a flangeway width that was more than 25% narrower than the previous section, coupled with a new wheel profile with a steeper flange angle and thicker flange was cause for concern among MBTA engineers and their consultants. In railway engineering circles, one of the most significant studies of the dynamic representation of wheel flanges in curved track was the Filkins-Wharton diagrams. These were manual calculations which incorporated wheel flange, angle of attack and wheel skew data relative to various curve radii to develop wheel flange “clearance envelopes.” With these diagrams, it was possible to represent what the wheel flange actually looks like in a curve in the top of rail plane. The Filkins-Wharton diagrams were an important tool in track design for many years. They were, however, somewhat difficult to interpret and use. When the MBTA decided to investigate the use of NP4aM girder rail as its standard rail section for street running track, John I. Williams, an independent consultant working for HNTB Rail Systems, took a creative approach. Using “Solid-Works” software, Williams produced Filkins-Wharton diagrams to develop a dynamic representation of the MBTA’s new wheel profile in a 50-foot radius curve. Because a wheelset is not radial when in a curve, a determination of the angle of attack had to be made for use with the Solid-Works program. Calculations showed that the angle of attack due to curvature in a 50-foot radius curve for the MBTA’s light rail vehicle would be about four degrees. This calculation included an allowance for skewing of the vehicle truck due to “crabbing.” The wheel flange skewed at an angle of attack of about four degrees made the wheel flange “clearance envelope” around 1/4-inch wider than the actual wheel flange at a point 0.25 inches below the wheel baseline (see Figure 1). The information developed by the Williams team was critical to the MBTA in its investigation of the NP4aM girder rail. Conventional wisdom had always dictated that gauge-widening, especially in tight radius curves constructed with girder guard rail, was necessary to allow free passage of vehicle trucks. The practice at the MBTA had been to increase standard gauge by 1/4-inch (to 56-3/4 inches) in single restrained girder guard rail curves (100-foot – 1000-foot radius) and to increase the gauge by as much as 3/4 inches (to 57-1/4 inches) in double restrained girder guard rail curves (<100-foot radius). Experience, however, demonstrated that widening gauge on tight radius curves actually led to excessive skewing of the vehicle trucks and a disproportionate amount of rail wear at the restraining rail faces of both the inside and outside rails. The same disproportionate wear was likely taking place on diagonally opposite wheels on the light rail vehicles. The practice of gauge-widening in curves was revisited by the MBTA while testing the NP4aM girder rail. A new set of criteria needed to be developed due to the narrowness of the flangeway with respect to the thickness of the wheel flange. The MBTA used the information produced by the Solid-Works software to determine the optimal gauge and flangeway combinations for the MBTA wheel profile in a 50-foot radius curve. The object was to balance the lateral wheel forces among all four wheels of the truck, with consideration given to the angle of attack and allowing for the fact that the wheelsets would not be radial to the curve. Williams’ analysis led the MBTA to take a completely different look at how to reduce the angle of attack at both leading and trailing axles, balance lateral wheel forces, combat truck crabbing, prevent wheel binding, and reduce rail and wheel wear. The analysis showed that instead of widening the gauge in tight radius curves, greater benefit, with respect to making the vehicle trucks more radial and reducing the angle of attack, might be derived by actually reducing the gauge. Because of the narrowness of the NP4aM flangeway and the geometry of the IWP flange, it was considered impractical to use the NP4aM rail on both the inner and outer rails of the curve. Calculations indicated that there would be virtually no free play for the wheelset traversing a 50-foot curve. Any discrepancy from the design gauge would result in excessive flange contact and potential wheel climb. As a result, other options were explored. The MBTA’s standard ballasted track consists of 115-pound rail on hardwood crossties with Pandrol plates and resilient fasteners. In curves, modified 132 RE restraining rail is bolted to the running rail(s) to create flangeways. The width of the flangeways and track gauge vary depending on curvature. The flangeways are adjustable through the use of a spacer assembly with shims. The MBTA decided that a combination of an inside rail 115-pound/132-pound assembly with an outside rail using NP4aM might provide an acceptable design option. The MBTA established a test site using a 115-pound/132-pound rail and NP4aM rail combination in a 50-foot radius curve in a turnback loop at the end of the Commonwealth Avenue branch of the Green Line. The new rail was carefully installed to as tight a tolerance as possible to remain faithful to the design gauge of 56-11/16 inches. The 115-pound/132-pound inside rail set was installed with a flangeway of 1-3/4 inches. The gauge and flangeway dimensions were intentionally conservative with respect to the calculated wheelset free play to establish a baseline for future testing. Strain gauges were installed at the test site to measure the vertical and lateral forces from passing train wheels. The forces were measured at four points at each of six locations throughout the curve: gauge corner of the inside 115-pound running rail; restraining rail face of the companion 132-pound rail; two points on the NP4aM rail; and the gauge corner and face of the girder flange. Data was collected for every car traveling through the curve. Field observations indicated that while it appeared that this gauge and flangeway combination was beneficial from an angle of attack standpoint, additional improvement could be expected. Subsequently, the gauge was reduced to 56-7/16 inches and the inside flangeway narrowed by 1/4 inch, to 1-1/2 inches. A random sampling of data from each of the two tests indicated that lateral forces were better balanced at the tighter gauge and flangeway configuration used for the latter part of the test. While the analysis of the gross lateral force data was somewhat elementary, it demonstrated that the conventional wisdom with regard to gauge-widening in tight-radius curves was flawed. Lateral wheel forces were better managed with narrower gauge and a narrower flangeway at the inside rail. As a result of the testing done by the MBTA, track design and maintenance standards for double restrained curves (< 100-foot radius) will be revised. The longstanding practice of gauge-widening in tight radius curves will be abandoned in favor of a set of criteria that will serve to balance lateral wheel forces and help control rail and wheel wear.